Frozenbyte, the developer behind Trine franchise announced yesterday Shadwen, a stealth game coming in 2016. You play an assassin and have to remain unseen. While on a King's quest, the character encounter Lily, a little orphan, and takes her on the journey ahead. More details, screens and trailer after the jump. Shadwen, an assassin on a quest to kill the king, has a chance encounter with a little orphan girl named Lily. Shadwen takes Lily with her on the dangerous journey. When the guards get close, Shadwen must take action right in front of Lily's eyes. Will she let the child witness crime and murder, or will she protect Lily's innocence? • Stay hidden - avoid detection and guards, who will ruthlessly kill you upon capture. • Time is an accomplice - time stands still until Shadwen moves. Carefully rewind time to manipulate your past and present actions to gain an upper hand on the guards. Make precision movements to nail each move and try different strategies for the ultimate solution. • Pick your assassinations carefully. Avoid being seen, heard or getting caught indirectly. Suspicious sights and noises will alert the guards - use it to your benefit. 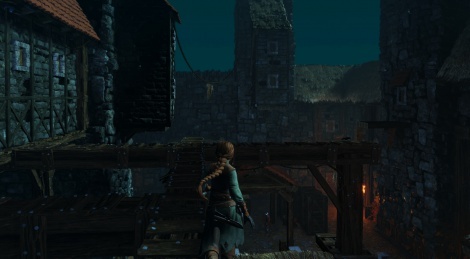 • Grapple and sneak around the dark and gritty medieval world and use the environment to your advantage - grapple onto rooftops, drop from ceilings, hide in the shadows. • Use physics and a freely attachable rope to weave a web of tangled objects, make deaths look accidental; let gravity do the grave work. • Set up traps and hazards to lure guards towards their early demise; discover new ways to eliminate or distract your foes by crafting items into deadly surprises, including poison traps, spike devices, smoke bombs and more. • Lethal and non-lethal solutions - choose your play style but remember: actions have consequences. • Become a true god of stealth and protect Lily's innocence - complete the game with no bodies left behind. • Jump anywhere and everywhere.